Growing up in the North, ethnic food was a staple of life. Living outside Pittsburgh, you had your Italian section, your German section, your Polish section, etc, etc. One of the best things of all those groups–the food! 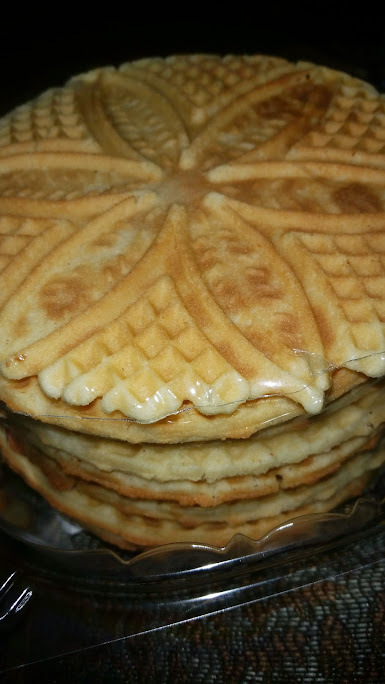 One thing I ate a lot growing up were pizzelles. Think a waffle cone that never gets folded up into a cone. Traditionally they also had anise flavoring, but many people just make them vanilla now. Obviously, traditionally they are cooked with wheat. On a joyous day, we found GLUTEN FREE pizzelles. You can get them online, or we actually found them at a Wal*Mart in Pennsylvania (yes, Wal*Mart!). If you cannot find them, you can order them online: http://glutenfreepizzelles.com/. Really a classic cookie for my family, and you can find out more about making them. You actually get a pizzelle iron, similar to a waffle iron. Some even come with a variety of presses, to make them in various designs. Mmmmm!